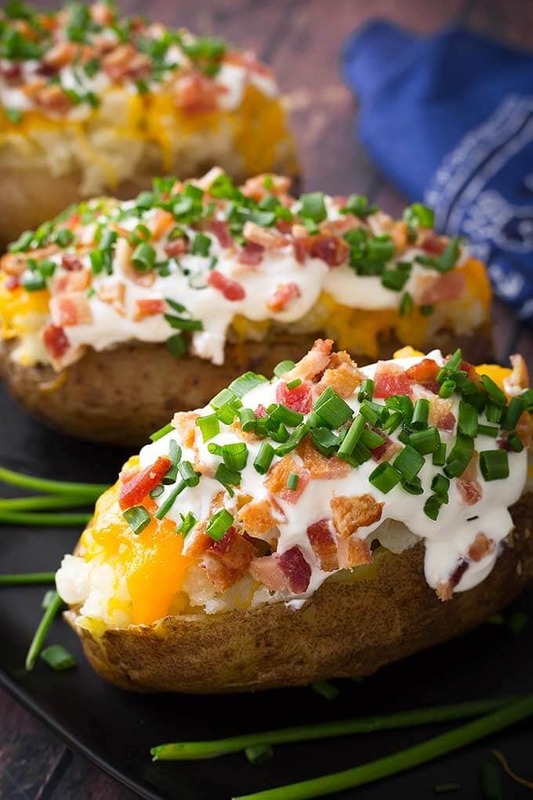 Make yummy, fluffy Instant Pot Baked Potatoes! They turn out so creamy and perfectly cooked in your electric pressure cooker. 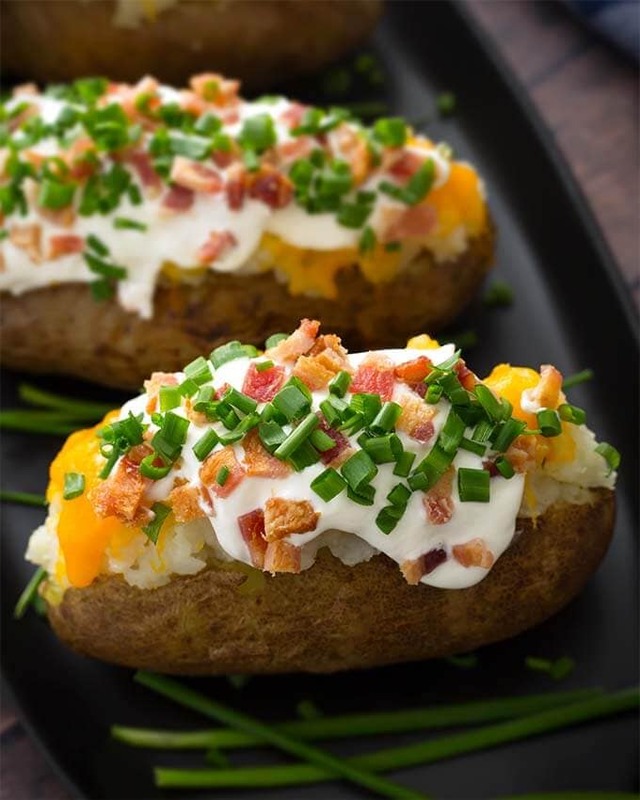 Making pressure cooker baked potatoes is so easy, and the resulting baked potato is much better than a microwaved potato! 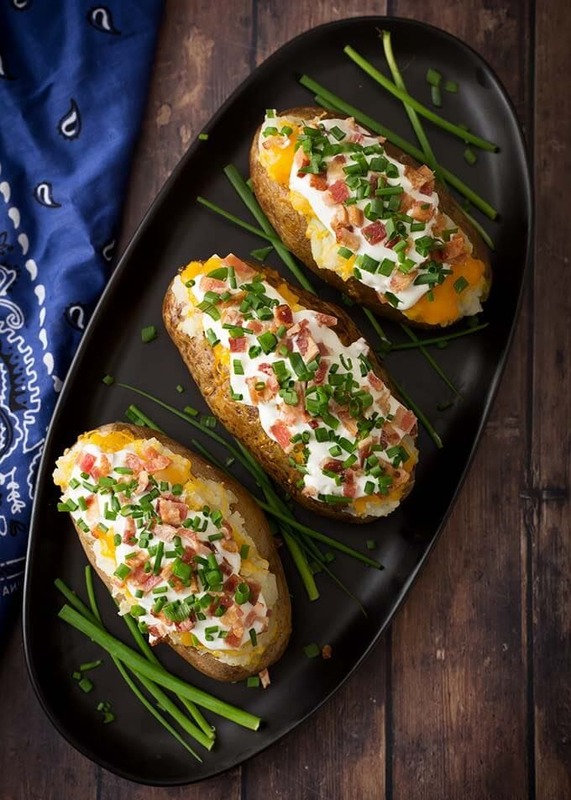 Give these pressure cooked baked potatoes a try! We eat a lot of potatoes in our home. With the hubby and the boys being true “meat and potato” guys, they love a good baked potato! I’m sorry to tell you that for a long time I resorted to making baked potatoes in the microwave. They weren’t great, but it was easy and I didn’t have to turn my oven on for an hour for 4 potatoes. I started making mashed potatoes in the Instant Pot a little over two years ago. They come out amazing! When we aren’t in the mood for mashed potatoes, I now make Instant Pot Baked Potatoes. I think they are awesome, and so do the guys. Much better than microwaved! Find potatoes that are similar in size if cooking more than one. Scrub the potatoes well, using a vegetable brush. Pierce the potatoes several times with a fork or a knife tip. Put 1 1/2 cups of water in the Instant Pot (2 cups for 8 qt). Put the metal trivet in the pressure cooker. Place the potatoes on the trivet and close the lid, locking it in place and sealing the vent. Cook on High Pressure for the amount of time needed for the size potatoes you have (see recipe card). Optional: Rub the cooked potatoes with vegetable oil and sprinkle with salt. Then crisp in a 400° oven for a few minutes. Top with butter, cheese, bacon, sour cream, chives, or any topping you like. Make a yummy, fluffy Instant Pot Baked Potatoes in your electric pressure cooker! 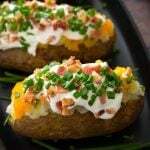 Making pressure cooker baked potatoes is so easy, and the resulting baked potato is much better than a microwaved potato! Place the metal trivet into the inner liner pot of the pressure cooker. Then pour the water in. Use 1 cup for a 3 qt, 1 1/2 cups for a 6 qt pot, 2 cups for an 8 qt. After scrubbing the potatoes, pierce the skin a few times with a knife or a fork. Then place them in the pot on the trivet. It's okay to stack them. When the cook cycle has ended, let the pot sit undisturbed for 10 minutes (10 minute Natural Release). Then turn the steam release knob to the Venting position to manually release the remaining steam/pressure. When the pin in the lid drops down, open the lid and check the potato for doneness. Pierce the potato with a knife. If the knife doesn't slide through easily, the potato needs a few more minutes cook time. Close the lid and set the time for a few more minutes. When the potatoes are done, you can crisp up the skin by rubbing a little vegetable oil on them, sprinkle with salt, and baking in a 400° oven for about 5-10 minutes. Slit the cooked potato lengthwise and open it so the toppings fit. 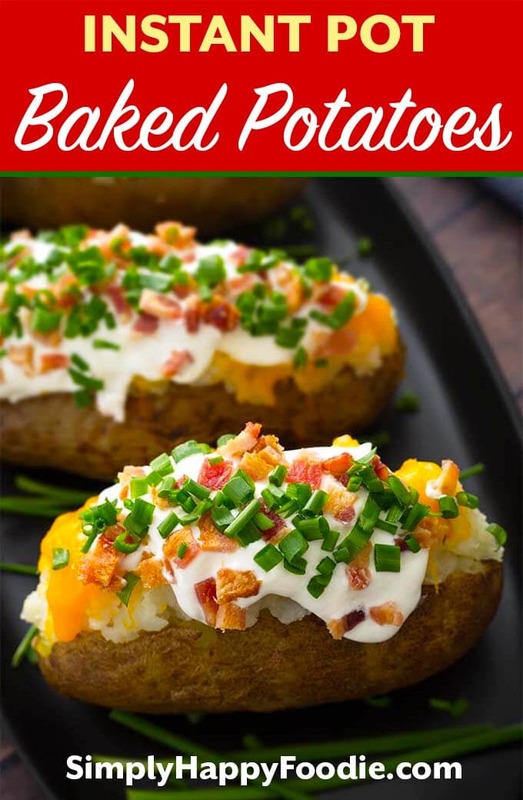 Top the baked potato with butter, cheese, sour cream, bacon, chives, or anything you like! Serve hot. This was so easy! I love how the potatoes turned out. I didn’t bother to put mine in the oven and they we’re perfect! Thank you. That’s great, Stephanie! I’m glad this worked for you. Thank you for your review! My first attempt at preparing baked potatoes in my Instant Pot and they came out even better than the potatoes baked in my oven last week! Very moist and fluffy. I used 2 russets (weighing 10.7 oz and 11.7 oz) and, set the Instant Pot to 25 minutes, 24 minutes probably would have been sufficient.